A refreshing take on the rich “bad girl” story. I was hesitant at first, thinking this might be one of the “same-y” types where the love of a good man changes the typical mean girl, and I worried that I might not connect to her (even knowing that… of course, her growth and self-realization would eventually become the main focus). I expected that it would become that way through a more melodramatic, angsty feel, but I was pleasantly surprised. 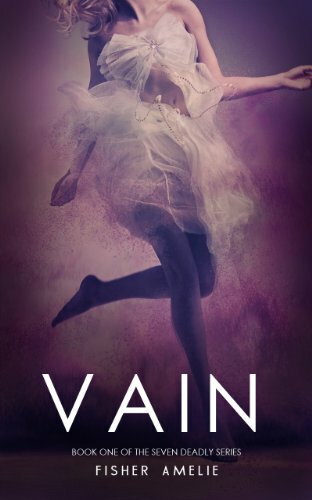 Jules: Loved Vain! The cover and description does not do the book justice. Thank you Paige Turner for your recommendation. It was an amazing book to start the New Year with. Claudia: Joanna, this book is amazing!! Kirsten: Joanna this book was awesome, and Soph does take a bit to get used to. The first few pages she was way to much for me, but she is redeemable, and the story is beautifully told. ClaudiaL What a wonderful way to end this year, this book was amazing!! Danielle: I loved this one! Emma: This book started my 2013 reading challenge. All the rest have some living up to do! …and then was delighted when it went where it did. And even then… I still wasn’t sure if I was up for that change of pace and was a bit disoriented when I got “there”. This is so different from what I’m used to, but it took no time for me to adapt, and I let myself live through her eyes. So for those of you who just want to read a beautifully written, sweet, sometimes sad, gentle story (no super-steam but romantically intense anyway), then stop here and go get it. What’s it about? I’m going to “vaguely” describe this for you, ’cause really, it’s best having no idea. Sophie is the prettiest and meanest in her wealthy-only group. She rules the roost, every guy wants her, and she takes what she wants, when she wants it and leaves her mess behind her. She hurts who she wants, even her best friend (and shows no remorse). In fact, she doesn’t even like her friends. They worship her, but… I don’t think they like her much, either. Her parents are cold and too busy to have ever personally taken care of her and to love her, and she struggles with that. Freedom is just that. Absolutely no restrictions. I abandoned myself to every whim I felt. Every want I fulfilled and every desire quenched. I wanted for nothing. Poor little rich girl, right? Yes, and yet, I was beginning to connect with her, anyway. She get’s into trouble one time too many, and her father has had enough. The world looks different, suddenly. I’ll let you find out what happens after that. I swoooooned in this one. The falling-in-love scenes were so romantically intimate and practically tactile. So intense, yet… barely there. Or at least, not in an obvious way. It was all in the detail and the author write each one exquisitely. To me, the subtlety was as intense romantically, as a fully detailed love scene. Just, in a different way. I felt my heart swell, and my adrenaline race with each delicate touch, and gaze, and… bite. That couch scene was *whooooooo* for me. And yet it was so innocent. No. Pure. Sure, I wanted *more* in that department. Having already been given all of the beautiful detail, the slow and believable romantic progression, and then had the author allowed us all of it, well, then… Yes. I would have been even more in love. I was expecting it to *ahem* fully develop and was a bit surprised that it didn’t (detail wise). To me, none of that takes away from the overall beauty of the story, the growth, and the amazing relationships that develop. I smiled at him and we stood quietly, our hands on one anther as if we were both awakening to whatever it was that was surrounding us then. It was written all over us. There was something practically tangible there, like a ray of sun, warming us through our souls. You could see it, you could feel it, but you couldn’t quite capture it in your hands. That didn’t mean it wasn’t there though. Oh it was there and it weighed a thousand delicious pounds. I let that pressure inundate me, let it tether me to him. 4 stars! (and often 4.5 stars). I often caught myself sighing in awe with regards to the elegant and introspective writing. Great review Maryse. I loved this one. I loved it, and loved it took me to a different place I expected. I felt a bit let down by the ending though, a little rushed? Loved it overall though. Yes agreed! The end was a bit quick… I needed that extra mile to jump this up to 5 stars. Will pick up this book next. everything you recommended in your 2012 list and “collide” was to die for. I used to be a historical junkie but now I am truly converted! Can’t thank you enough for introducing me to travis, will and all the others! Recommended noelle erin metamorphosis! Loved this book! I was going to give up but as I read the reviews I gave it a try! So unexpectedly surprised by this book!! I thought I knew where this boom would take me but it went even further and left me awed by where it ended. Would love to see more of Sophie and Ian’s story.